Tim is Just Love’s Eastern Coordinator. He works with groups in Norwich, Cambridge and (less intuitively) Birmingham. He grew up in Essex, going on to do a Discipleship Training School (DTS) with YWAM straight after finishing school. 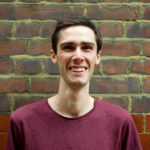 He moved to Cambridge to study Geography, and was really involved in both Just Love and the Christian Union there, as well as developing his passion for environmental activism. Tim gets fired up by the intersection of mission, justice, prayer and worship, loves languages and wants to live in France. He feels like those things are probably connected, but isn’t quite sure what that looks like just yet.